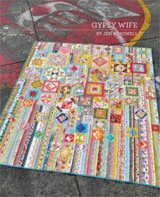 Can I quilt with a domestic sewing machine? Yes, absolutely, positively, you can quilt on a domestic sewing machine! 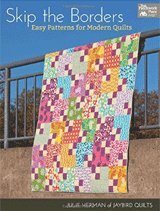 If the only information you had available on machine quilting was the current batch of quilt magazines, you'd quickly come to the conclusion that you need a frame system to mount your dedicated quilting/sewing machine on. You'd also think you needed a machine with at least an 18 inch arm. But this is not true. Not at all! Now, I don't think there's a domestic machine quilter out there who would refuse a sewing machine with a larger throat space or arm, BUT, you don't need a long-arm or mid-arm machine to quilt on. Period. Anyone who tells you you do, is blowing smoke. Start on small, real projects - Table runners, placemats and small wall hangings are a perfect place to start. You feel a sense of accomplishment when you finish a project AND you won't be wrestling with the quilt while learning to quilt it. 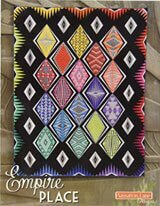 If you start with a quilt the "size of Egypt" (my good buddy, Cathy L. came up with that moniker! ), you won't have any fun, and will probably not want to quilt again. Get used to looking at your work - We quilters tend to judge ourselves too harshly. Go to any "Show and Tell" at a quilt guild meeting and I guarantee you that some quilter will stand up, show their quilt, and then proceed to point out mistakes. I do it too! Placemats, something that gets spilled on and washed frequently, should get you used to seeing your own work. 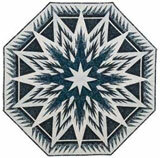 This website has many pages specifically devoted to the domestic machine quilter. We are domestic machine quilters, ourselves, and all the quilting on the pages of the site (with the exception of our online "Show and Tell" where quilters post pictures of their own quilts) is done on domestic sewing machines. If it's not, we give credit where credit is due and tell you the name of the long arm quilter. In our section on the Best Sewing Machine for Quilting we discuss the features we believe you need for machine quilting. In a nutshell, the MUST-HAVE features are: a good straight stitch, the ability to lower the feed dogs, and that you love your machine. If you love your machine, you know how it sounds when it's working properly and when there's a problem. You're not fighting the sewing machine. There's enough to learn to manage at the beginning of learning to machine quilt, that the last thing you need is to be fighting your machine, too. How to Machine Quilt Your First Quilt shows the order of quilting a quilt. 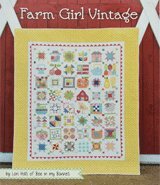 While this might seem a totally beginner topic, stitching those first stabilizing lines of quilting can make all the difference in the final look of the quilt. Once you are comfortable with using your walking foot for machine quilting, then I would suggest moving on to Free Motion Quilting 101. This is where you'll put on the darning or hopping foot, drop your feed dogs, and you get to run the whole show. If you get stuck, then do exactly as you did here and ask a question. I will do my best to answer it for you. Just go to Ask your Machine Quilting Questions. I hope I've given you enough confidence to quilt on your domestic sewing machine. It'll take practice, for sure, it does for everyone...BUT this is one of the most fun and satisfying aspects of quilting! P.S. To our Readers: Did I miss anything? Please do join in to encourage our fellow quilter with a comment below!